This morning I woke up with Will puttering in the kitchen. He decided to make the most incredible recipe, an outstanding, super premium ice cream with a butterfat content of 18%. You will not find a better recipe anywhere! Believe me, we have had years to experiment with more than a few recipes. The recipe called for sweetened condensed milk and we didn't have any so, he was busy making my DIY Sweetened Condensed recipe. One of the ingredients in the sweetened condensed milk is baking powder and I hadn't made up a new batch yet, so, Will ended up making homemade baking powder so he could make homemade sweetened condensed milk, so he could make homemade ice cream! What a trooper! I found this recipe by Doc Wilson on the Internet a few years back. This recipe won first place in the 4th Annual Killis Melton Ice Cream Crank-Off in McKinney, Texas in August, 1999. This is also the first of Doc Wilson's recipes to be produced commercially in Indonesia, with his permission. I have also used Doc's recipe to make a half batch of strawberry ice cream. 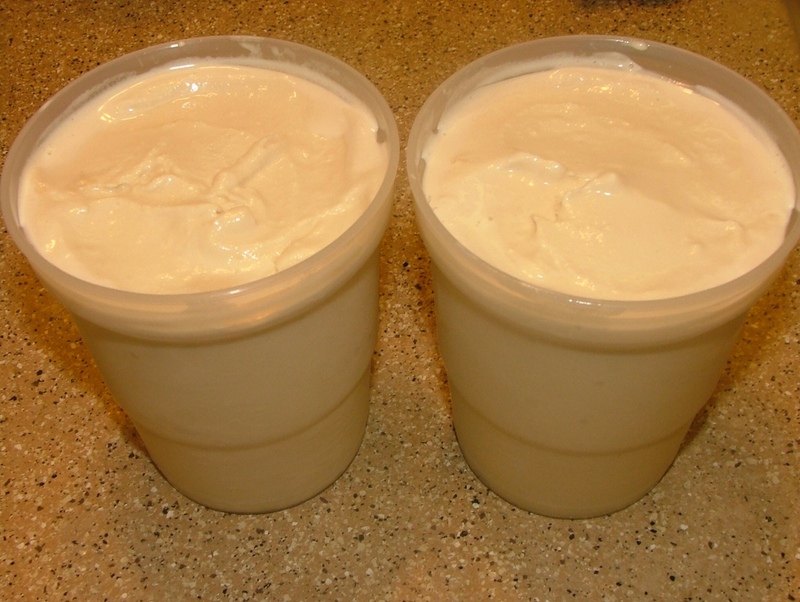 I offer you a recipe for 2 quarts of the BEST homemade Super Premium Vanilla Ice Cream you have ever tasted! This basic premium ice cream gives you a delicious medium into which all sorts of delectable additions can be made! I have selected to keep 1 quart of my basic recipe untouched . . . the flavor and texture are unrivaled, even by Haagen Daz! The sky's the limit on what additions you choose to make. My personal favorites are Lemon Custard and Fresh Strawberry Ice Cream. I divide my custard evenly, using 3 cups of the original custard recipe when making a quart of Lemon Custard Ice Cream, however, when making *Fresh Strawberry Ice use only 2 1/2 cups of the custard to allow for the added volume of the strawberries and keep the extra 1/2 cup as vanilla. Please note: These recipes use raw eggs. * If you are concerned about Salmonella, dip eggs in boiling water for 5 seconds and then into iced water to cool the egg shell quickly to keep the egg from cooking. I use our chickens' eggs and have never a problem. Super Premium Vanilla Ice Cream custard ready for the refrigerator. This recipe makes 6 cups of liquid, which equals 2 quarts of frozen ice cream. 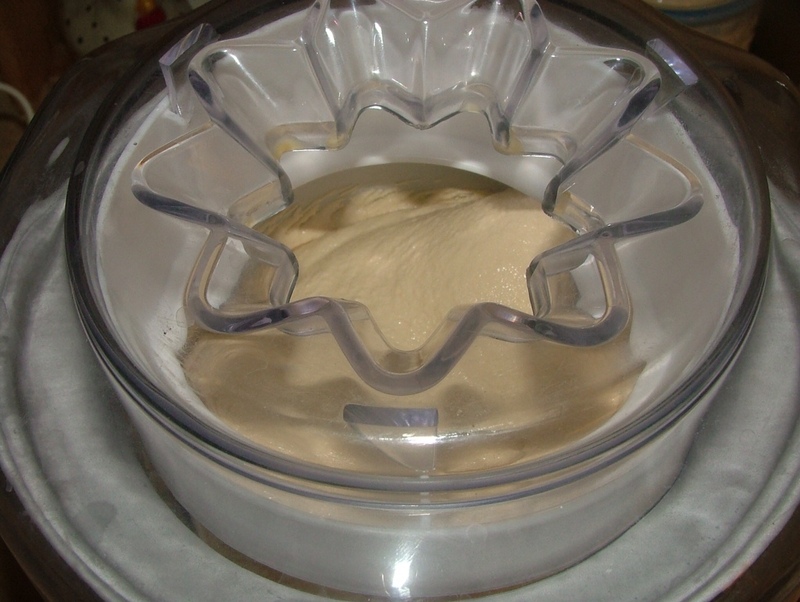 If you are using a 1 quart Cuisinart Ice Cream Maker, make your ice cream in two batches. 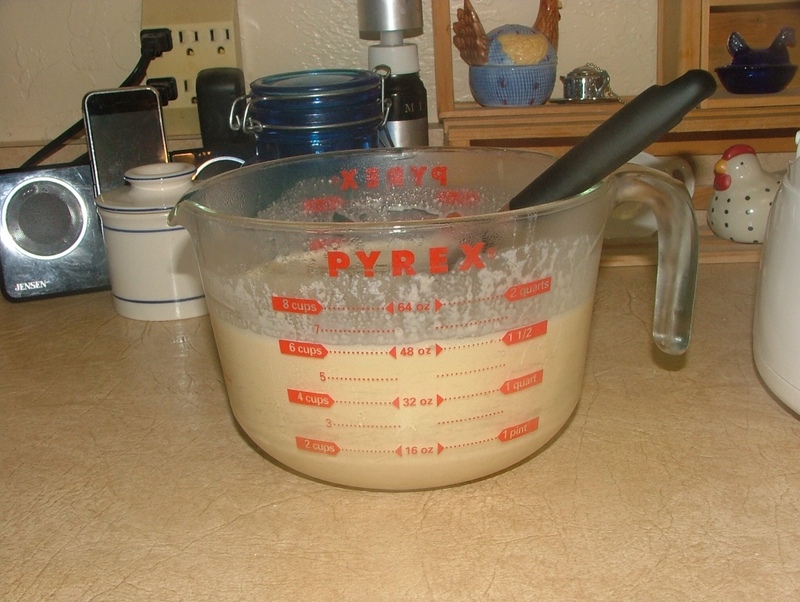 In a large mixing bowl whisk 2 eggs. Add white and brown sugar and whisk thoroughly. Add whipping cream and half and half, salt and vanilla and whisk thoroughly. 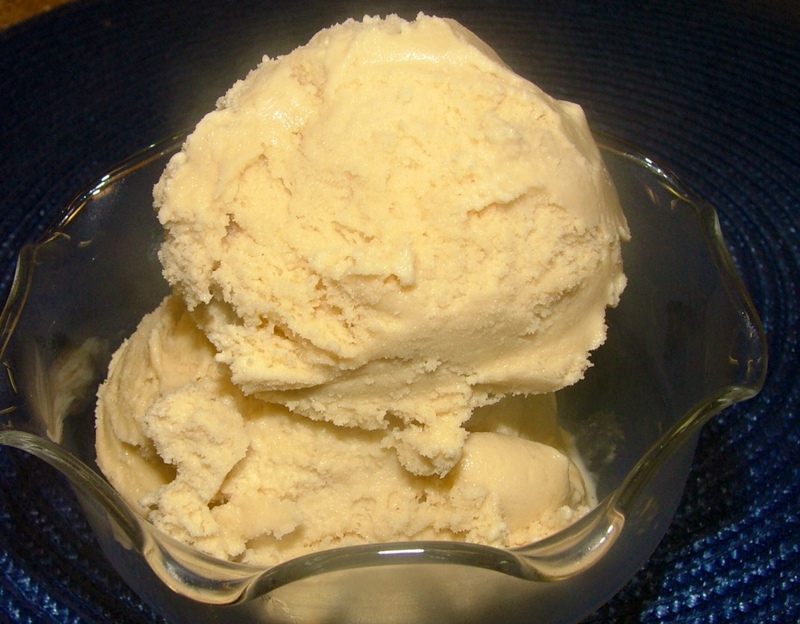 For best results: Let ice cream custard chill for at least 4 hours to "age" and get very cold. Pour 1/2 of ice cream custard into ice cream maker and freeze according to manufacturer's instructions. (aproximately 22 minutes). Pack in freezer containers and place in freezer until hardened. Super Premium Vanilla after 22 minutes. These Ball pint freezer containers work great for storing and scooping your ice cream! My recipe variation uses 3 cups of the Super Premium Vanilla custard. Zest from 1 scrubbed lemon, finely grated. In a small bowl, whisk 1 egg. Add beaten egg to 3 cups of ice cream custard; whisk to incorporate. Finely grate the peel of lemon and stir into custard. Let custard sit over night to infuse it with the lemon's oils. Pour lemon custard into ice cream maker and freeze according to manufacturer's instructions. Spoon ice cream into freezer containers and place in freezer. Prepare strawberries the night before. 2 cups of strawberries, cleaned, topped and cut into medium size pieces. Place strawberries in a small bowl with lemon juice and sugar, stir to mix. Cover and refrigerate overnight to macerate (allow juices to flow from fruit). Stir in strawberry juice and pour into ice cream maker; process according to manufacturer's directions. 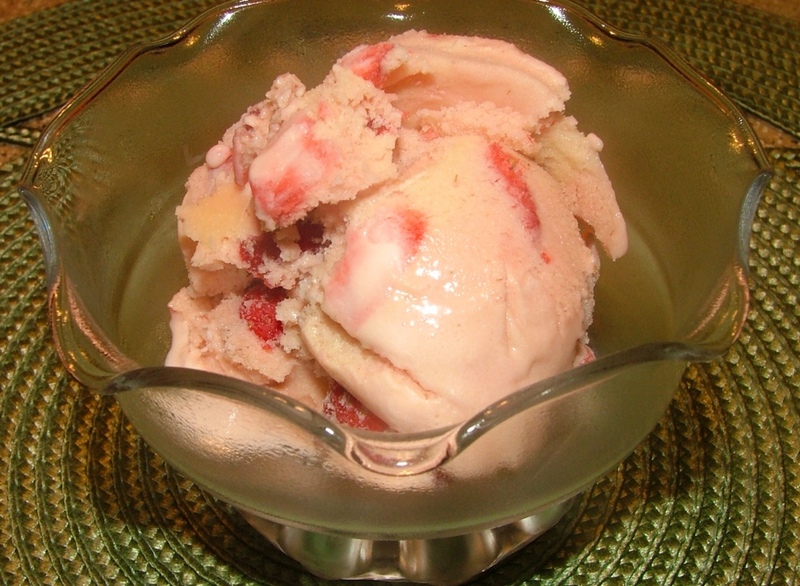 When the ice cream is almost frozen (about 20 minutes) break up strawberry pieces; add fruit and finish freezing. Optional, stir in 3 drops of red food coloring. Spoon into freezer containers and place in freezer. Fresh Strawberry Ice Cream . . . Yum! Please note: By adding strawberries and their juice, you have increased the volume of this ice cream. Don't forget to save the strawberry tops for your chickens! After all, they have made a delicious contribution to your ice cream custard! If you have a hankering for super premium ice cream but your pocketbook says, "NO", these recipes will give you the real deal, at a fraction of the cost. Rich, creamy, vanilla-laced custard from Over at Julie's! Loved the vanilla ice cream! It's a keeper. Thank you for sharing it. You're very welcome! It doesn't get better than this ice cream recipe! Julie.......... In this recipe, regarding the brown sugar, are your instructions 1/4 cup, or 1 & 1/4 cup please? It's 1/4 cup of light brown sugar not packed . . . . . Will and I have tweeked the amounts and use 3 tablespoons of white and 3 tablespoons of brown sugar. The ice cream is still plenty sweet, and you won't miss the extra sugars.